We are pleased to bring you this review of the ClassicFlame Felicity 47″ Wall Mounted Infrared Quartz Fireplace # 47II100GRG. It also comes with a stand so it can stand alone on top of a shelf, dresser or other piece of furniture. This infrared electric fireplace has a number of features and we want you to understand exactly what this unit can do for you. At the end of the review there is a pros and cons section. These are summaries of reviews left by actual buyers. Please read all of this review so that you can make the right decision whether to buy or not. Spoiler Alert: This fireplace has multiple flame settings and colors. It also features different color sidelights. This fireplace has those ‘special effects’ many folks are looking for. This is a modern, linear wall mounted electric fireplace that has a modern look. The flame effects are mesmerizing and it is something that everyone will enjoy looking at for hours. The flames are realistic and the infrared heater will heat most rooms very well without drying out the air. Every now and then we get to review an electric fireplace that has multiple flame effect and lighting modes. This is one of them. This fireplace has flame effects that are extremely adjustable in terms of brightness and color. There is also dramatic side lighting for even more effect. The flame effects with this fireplace look awesome and they are powered using energy efficient LED lights that will last for a long time so you don’t need to worry about changing them. ClassicFlame have included their Spectrafire™ technology with this unit, and with this you can have a traditional flame effect or introduce amber and blue flames with 3 different brightness settings. The firebox also features LED side lights and up lights which really add to the fire effect. There are five color options with these lights and there are five settings, the first is lighting off then there is blue, amber, blue and amber and a color cycling mode. You can have the flame effects switched on without the heater so they can be enjoyed every day of the year. Another fantastic feature is that you can change the media in the fire bed fire bed between, stones, glass or logs in whatever colors you want. This fireplace has an infrared heater. The heat comes out of the front top of the unit in a downward direction . There are three infrared quartz elements that are designed to provide supplemental heat to a room up to 1000 square feet. Being an infrared heater means that the air will remain moist and not dried out so you will be comfortable with the heat output. Infrared heat is different than regular heat production click here for the infrared differences. The following wall mounted electric fireplaces have been comprehensively reviewed at Cozy By The Fire. Just click on the text link to go to the review. Clicking on the images below will take you to Amazon for more information and today’s lowest discounted price. Onyx 50 Inch Wall Mount Fireplace. Available in Black or White. The fireplace can be controlled by either using the control panel which is located at the top right of the unit or through a remote control. The remote control is full-function and controls everything on the fireplace. There is a power button where you can turn the fireplace on or off. Then you can adjust the brightness of the Spectrafire flames and also the amber and blue flames. There are three brightness levels for each. You can adjust the thermostat and set the desired temperature level. The thermostat can be adjusted in 2°F increments. You can also change the temperature display from Fahrenheit to Celsius easily. The side lights and up lights can also be adjusted and there is a timer function with ten settings from 30 minutes to nine hours. This heater is 46.6 inches wide by 10.2 inches deep and 23.4 inches in height. It weighs a total of 52.4 pounds. The unit will need to be assembled and then either mounted on the wall or on a stand. A remote control and user manual are included. There were a lot of customers who thought that the fireplace really looked great in their rooms and one person described it as “the greatest fireplace”. Others described it as “perfect” and a lot said that it looked “beautiful” and “very stylish. “Installation was really simple” – many customers were happy with the assembly and installation of the fireplace. One customer described the assembly instructions as “the best ever” and a few said that the unit couldn’t have been easier to install. If you are wall mounting it by hanging it, it is just like hanging a heavy picturem easy peasey. To flush mount it you have to cut a hole in your wall so a little more skill is needed. Don’t forget it comes with a stand so you can set it anywhere. “The heat output is impressive” – a lot of people complimented the output of the heater. Although it is described as providing supplemental heat, a lot of people used the fireplace as a primary heat source and were very satisfied with the amount of heat produced. There were a few comments about it heating rooms quickly. This infrared heter is better than most standard electric fir place heaters that simply use hot air. There were also favorable comments about it being a good value and at a good price point. “The flames just don’t look real” – one customer thought that the flame effects didn’t look real and another said that they were not natural looking. 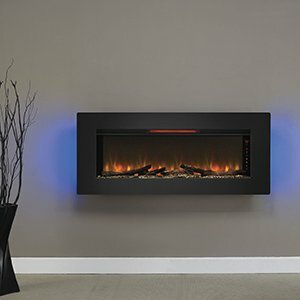 We have pointed out several times this is a modern fireplace with different flame colors and lighting options. Most other fireplaces are just going for 1 look a natural look. So if you are strictly looking to duplicate ‘real’ fire this may not ne the best choice for you. Kind of like buying a casual suit and then complaining iys not formal enough for you. Frankly, we love the versatility and different effects as do most buyers.This ‘realism’ criticism was contrary to the majority view and any artificial flame effects are going to be criticized by a few people. “Heat output is pretty minimal” – there were a handful of customers who were not impressed by the heat output of this fireplace. One said that there was hardly any heat at all and another that it would not heat a big room. There could have been a problem with the fireplace that produced little heat and this should have been returned. It is designed for supplemental heat and most of the customers were happy with the heat output so this is not a major issue.“The fireplace was damaged when it arrived” – one person experienced damage to the unit when it was received. This can happen when delicate units are shipped and the fireplace can be returned for a new one. that’s the beauty of shopping with Amazon. There were several reviews of the ClassicFlame Felicity Infrared fireplace and 75% of the reviewers gave a 5 out of 5 star rating and a further 12% awarded a 4 out of 4 star rating. This is 87% combined which is very impressive. This decorative wall mount fireplace will look really good on your wall and is likely to impress all that see it. The flame effects are good and the heat output is sufficient for most rooms, and being infrared it leaves the moisture in the air for added comfort. This fireplace is definitely recommended. We like this fireplace a lot.